As with art, leadership is the embodiment of an idea. Claude Monet sought to capture the way light moves in air (and made quite an impression doing so). Here’s how to discover what idea you embody– no water lilies required. For Claude Monet, a fascination with visual perception prompted a lifelong ambition to “paint the air”: to study and represent how light breaks up on objects and how it scatters on water. Monet imagined the intangible and made it palpable–through thick brushstrokes and dabs of electrifying color. The result of his extraordinary grasp of color and light was impressionism, one of the most dazzling and innovative movements in art history. His intent was to capture the ﬂeeting conditions that surrounded and encapsulated objects, the subtle poetry of rural light mainly found on his Giverny estate and in neighboring ﬁelds. The most arresting lesson from Monet is that the life of wonderful works begins as an abstraction–as a vague concept that the artist is invested in reﬁning and realizing. As with art, leadership too is the embodiment of an idea. We usually refer to these ideas as vision; however, we think that word is overused and feeds the egotism of leaders. We prefer to use the word intent because it is naturally coupled with behavior, whereas vision is not. Too often the production of vision statements is a stand-alone exercise with no forward thrust: meaningful strings of words with no impetus behind them. On the other hand, intent is the immediate precursor to action. Intentions keep us focused on what is most important to us and guide our behaviors accordingly. In addition, unlike vision, intent situates responsibility. When the author of an idea states what he or she is trying to do, there is no question who is supposed to do it. Indeed, vision and mission have become the products of ritualistic corporate exercises that rest inertly on walls or in corporate promotional materials as camouﬂage for the real business of making money. If the mission were so important, then presumably you would know what yours is. Do you? Intentions cut through corporate-speak by which we exhaustively dissemble vision, mission, objectives, and goals, often getting trapped in the minutiae of an esoteric exercise and losing sight of our true aims. All we really want to know is, “What is the problem you are trying to solve, and what are you going to do about it?” The speciﬁc aims generally are to enhance the organization’s ability to compete by improving upon the many facets of innovation, operational efﬁciency, and executional excellence. At the highest corporate levels, expressed purposes may include bringing families closer together, promoting healthier lifestyles, making people happier, and nourishing the human spirit. Like Monet’s strivings, these intentions are fantastic, and their resolution can only be loosely planned. The problems are difﬁcult, poorly deﬁned, and open to many possible solutions, some of which only will become apparent over time. If you want to achieve the impossible, then you will have to be able to live with ambiguity, periodic setbacks and disappointments, and occasional self-doubt. You should prepare yourself for a lengthy and trying exercise. One of the most notable aspects of Monet’s work is that he devoted himself to his self-imposed problem for decades. He was consumed by getting it right. While he could have been resting peaceably on his estate in his later years, he continued his rigorous exploration of light and color. Once started, a journey of this magnitude is never entirely satisfactorily concluded. There is always more to do and to perfect. 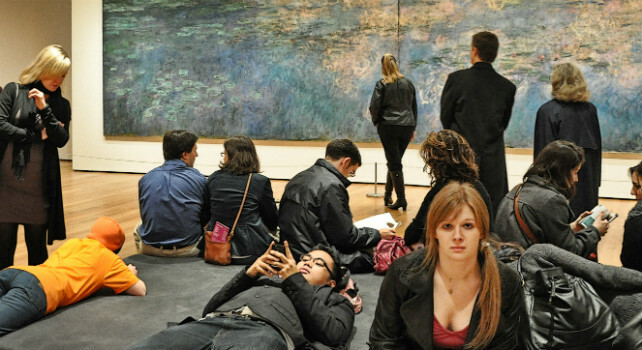 On the other hand, had Monet’s intentions initially been fame and fortune, there would have been a logical end state. In that case, there is nothing special to work on except how to mingle with the right crowd and accumulate wealth. The effort shifts from making real art to producing agreeable re-creations and cultivating public relations. Similarly, if your purposes are to acquire power, enrich yourself, and control a vast corporate empire, the skills you will need for success will be quite different than if your ultimate aims are sublime. The great artists of the Salon or workplace have more enduring and uplifting motives and intentions than vainglorious ones. and failed at it. They were able to learn from others because they were looking at the right things, importing into their behavioral repertoires what they believed they could use someday. They borrowed from the best, seeking out their feedback and advice and gradually fashioning an image of an ideal of their own. When someone tries, something magniﬁcent happens: even the clumsiest improve. People really do get better if they have in their minds the kind of workplaces they want and the types of leaders they wish to be. If what they eventually hope to achieve conﬂicts with a company’s brand of leadership and associated culture, they pack up and go where they can express themselves. These exits aren’t atypical. Many of the more entrepreneurial and talented leaders leave and start their own companies because they know that their version of leadership will never be realized where they are. 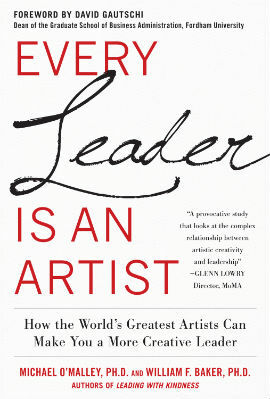 From Every Leader is an Artist by Michael O’Malley, Ph.D., and William Baker, Ph.D. Reprinted with permission from McGraw-Hill. Copyright 2012.